In the nineteenth century Britain saw a gradual yet pervasive shift from oral tradition to written culture. This shift, in which Hill’s postal reforms played an integral role, is one of the leading concerns of Hardy’s fiction. 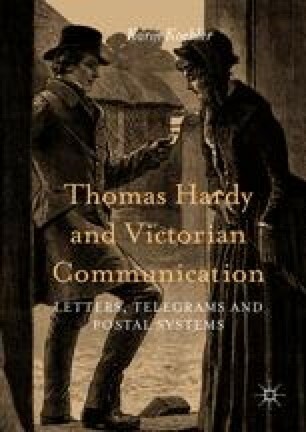 The aim of this chapter is to show from the outset how significantly Hardy’s portrayal of written communication, and letter writing especially, was shaped by his perception of the social and cultural impact of technological innovation. I thank VSAWC, and the editors of the Victorian Review in particular, for permissions to base parts of this chapter and Chapter 7 on my article ‘“essentially separated in spite of all uniting factors: Thomas Hardy and the Community of Letter Writers’, Victorian Review 41, no. 1 (2015).